10 years old in 10 weeks! Wow! Dignity is going to be 10 years old this autumn. This landmark birthday feels like a watershed as we look back and see how far God has brought us and look forward to what we believe God is laying before us. We would love you to join us in celebrating and thanking God for all he has done and committing our future to him. There are 2 simple ways to celebrate with us. We will be hosting a Birthday Party on 7th October in Manchester, UK. We would love you to join us. Even better, can you bring 10 friends? Tickets will be available soon. In the meantime, express your interest in joining the fun or sign up to volunteer on the day by emailing us. 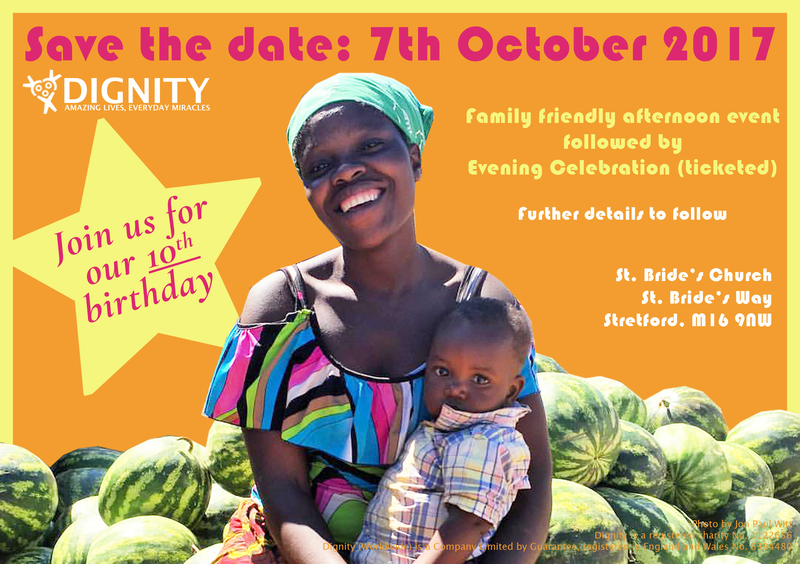 You could host a party on the same day, 7th October, or organise a Dignity Sunday at your church the next day. Let us know you are planning something and we will send you a Birthday Pack with stories and videos that will equip you to share the story of Dignity and celebrate with us. Order your Birthday Pack by email.